Hermenegild is drawn from Chapter Nine, beginning on page 241, of Volume Five, The Sword of Islam of the twelve-volume historical series The Christians: Their First Two Thousand Years. If you would like to order this book please visit www.TheChristians.info. It is one of the ironies of early medieval history that almost all the barbarian tribes who founded Christian Europe, with the notable exception of the Franks, were Arian, not orthodox Christian, when they broke through the Roman frontiers and found themselves confronting orthodox Christian belief. This story played out differently with each nation, but none is more fascinating than the drama of the Visigoths in Spain, centrally featuring the prince and martyr Hermenegild. Hermenegild’s father, the Visigoth king Leovegild, who subdued most of the Iberian Peninsula by the late-sixth century, did his best to make its inhabitants embrace Arianism, sometimes by persuasion, sometimes by force. But Leovegild’s first wife, Hermenegild’s mother, embraced the Christianity of the Nicene Creed. She greatly influenced her son, although she died when he was a child. Moreover, his father arranged for him a political marriage to a pious and notably steadfast Christian princess named Ingunthis, daughter of King Sigisbert of Austrasia. Even so, Hermenegild might have kept his religious sympathies to himself except for his stepmother, Goswintha, Leovegild’s second wife.1 This woman, a devout Arian, constantly abused poor Ingunthis both physically and mentally, to make her abjure her faith. At length, the sympathetic king sent the young couple out of Goswintha’s reach by assigning Hermenegild to govern his southern territory from Seville. However, the move placed the prince in a heavily Christian district of Hispano-Romans, and next door to one of the remaining Byzantine possessions in Spain. It also brought him into the orbit of Leander, the brilliant monk and priest, later to be named archbishop. In any event, Hermenegild announced in 579 that he was abandoning Arianism, and was received into the Christian faith by anointing with holy oil. Unfortunately, this awoke the national aspirations of the region’s Hispano-Romans, who proclaimed Hermenegild king and raised a rebellion against his father. When Hermenegild accepted the rebel role–whether through faith, political ambition, or both–a complex and brutal six-year war began. The prince reportedly was deaf to all paternal entreaties, especially after Leovegild began another brutal crackdown on Nicene Christianity. His claim was backed by the Suevi, rival barbarians with aspirations of their own, and he was initially aided by the Byzantines (but later they sold him out to his father). Whether this was Leovegild’s intention is far from clear, but death did not end Hermenegild’s story. Although most orthodox bishops had not supported his rebellion, the lower clergy probably did. 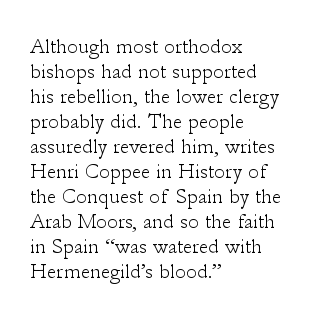 The people assuredly revered him, writes Henri Coppee in History of the Conquest of Spain by the Arab Moors, and so the faith in Spain “was watered with Hermenegild’s blood.” A year later, Leovegild himself, on his deathbed, may have accepted the Nicene Creed; some chroniclers claimed he would have done so long since, but for his implacable wife. In due time, the martyred prince was recognized as a saint. Meanwhile, his younger brother Reccared, an able ruler and still officially Arian, took over the Visigoth kingdom, and within three years was able to commit himself and the kingdom to Nicene Christianity. Even Reccared could not eliminate endemic Visigothic conflicts over the royal succession, but his fifteen-year reign nevertheless inaugurated a century of relative peace and prosperity in which the Christian faith could grow strong. 1. The labyrinthine intra-family relations of the Germanic dynasties can severely tax comprehension. Ingunthis, the Frankish princess who was married to the doomed Visigoth prince Hermenegild, was in fact his cousin. Goswintha, the fanatic Arian queen who so cruelly treated the young bride, was both her grandmother and his stepmother. The widow of Hermenegild’s uncle, Goswintha had subsequently become the second wife of Hermenegild’s father. 2. Most historians agree that the unfortunate Christian princess Ingunthis did not long survive her husband, although her precise fate is unclear. Her Frankish relatives seemingly believed she was dead, but accepted the assurances of her brother-in-law Reccared that he was not responsible. According to one chronicler, she and her infant son took refuge with the Byzantines in southern Spain, but both died at Carthage on the way to Constantinople. All rights for this article on Hermenegild are owned by the Society to Record and Explore Christian History (SEARCH). In accessing this page on Hermenegild you agree to only download the content for your own personal non-commercial use.